Plan on using a cab while in Vegas? Read this first! | ScottyVegas! And receive email notifications of new posts. Its simple just enter your email address and press submit. 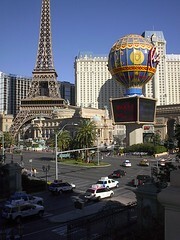 • Metered taxi fares to major hotels on the Strip cost approximately $15–$25. A consolidated car-rental center is three miles from the terminal and is accessed by shuttle bus. ScottyVegas always rents a car. Plan on using a cab while in Vegas? Read this first! I can honestly say I’ve only used a cab in Vegas a hand full of times. My preferred method of transportation is by renting a car (see post on Rent a Car Tips). But with that said, using a cab can come in handy. One invaluable time was just a couple of years ago when we found ourselves on the far south end of the strip while we were staying on the far north end and it was after 2:00am. It was cold, we were tired, plus we had our fair share of adult beverages. Then the idea came to mind to use a cab. Hmmmm, walk 30-40 minutes or take an 8 or so minute cab ride? The decision didn’t take long… even though it’s typically against my frugal way to use cabs, I will certainly say that was the BEST $15 spent on that trip. Las Vegas Taxi drivers cannot pick up passengers off of the street (flag or hailed ride). Taxi passengers can only be charged the amount shown on the taxi meter. By law, each cab can only take 5 people, including infants and children. These are just a few examples from Did You Know, a tip sheet published by the State of Nevada Taxicab Authority. I strongly recommend that you read through it before your next trip, I bet some of them will surprise you. When you enter a taxicab, the driver will start the taximeter (referred to as the “drop”) and an initial charge of $3.30 will register. If a taxi ride originates at McCarran international Airport, an additional airport surcharge of $1.80 per trip is added to the taximeter. After the initial “drop”, the taximeter will assess a fare of $2.40 per mile ($.20 for each 1/12th of a mile traveled). If the taximeter senses that the taxicab is moving less than 8-12 MPH, the taximeter will assess a charge of $.20 every 24 seconds ($30.00 per hour waiting time). That is why the taximeter continues to accumulate charges even when the taxicab is not moving. Once the taximeter senses that the taxicab is moving at a speed greater than 8-12 MPH the fare calculates on the actual distance traveled. Another page you might find handy, is this chart with approximate minimum fares to various Southern Nevada locations. Use it when planning for your next trip or in helping you decide whether or not to rent a car or other mode of transportation. It covers Taxicab fares and fees along with a chart of approximate charges to/from common destinations. Every city seems to have cabby scams. One popular scam in Las Vegas is “Getting Tunneled” or “Tunneling” these names refer to when a cabbie picks you up from the airport and takes you “Long Hauls” through a tunnel to I-15 (expressway) to your hotel on the strip. In most cases this is NOT the most direct, quickest, or most cost effective route to take. This practice is actually against the law, which, if caught (and they do), the cab driver will get fined. So if the cab driver risks getting fined, why do they continue to do it? Simply put the reward outweighs the risk. At about $6 -7 more per trip and the fact that the Taxi Cab Authority has limited staffing the odds quickly jump in the cabbies favor. So what can you do to avoid being tunneled? Well if you are staying on the strip simply say “No Tunnel” or ask the driver to take the most direct route to your hotel. Feel you been violated? You can file a complaint with the Taxicab Authority at (702) 486-6532 (Staffed 24 hrs.) or online taxi.state.nv.us. Note: In order for the Taxicab Authority to investigate a complaint, you must include in your statement: Your name, date and time of incident, where it occurred, the cab company and cab number. It is also helpful to include the driver’s name and driver’s Taxicab Authority Permit number if you can get it. REMEMBER: Las Vegas may be called sin city but it is still illegal to drink and drive. So even if you are renting a car don’t be stupid and ruin your trip by taking unnecessary chances, leave those for the tables, walk or better yet take a cab! Here in A1 Bel Red Town car & Limo Service you can actually avail a discount. You don’t have to spend a fortune for a comfortable transportation; just employ our services, pay a small amount, and let us do the rest for you. “Welcome to the Mirage Mr. Pappageorgio”, she’s a beaut! Monte Carlo Las Vegas Is Looking Good! Recent reviews by ScottyVegas ..